My video’s quality actually wasn’t all that hot, I must admit. The demolition was to occur a little after daybreak, at near 7:00 a.m., and it was cloudy. I did try to get a vantage point as close as possible where there was very little jockeying for position from the crowd of thousands who showed to witness the event. I also planned ahead sufficiently to prepare by bringing a folding chair, allowing me to stand above the crowd around me. But, I was unsure how long the demolition would take – things like this can be unpredictable. So, I set my camera (a Nikon Coolpix S51 that I’ve used all the way around the world) to a little lower resolution, “small size 320”, instead of higher resolution. This gave me more minutes of film time, and allowed me room to shoot some photos as well. Even considering that my video was not of the highest quality of those posted for the demolition, and even though some others had better vantage points, my video became one of the top two most popular posted on YouTube, ranking in searches there as well as within Google, under Universal Search. So, how did I accomplish it in one day flat? Second, I gave the video a keyword-rich description which further reinforced each of the main keyword phrases I was targeting. I custom-wrote the description, mentioning a small amount of the facts outlined in the Wikipedia article for the Texas Stadium. 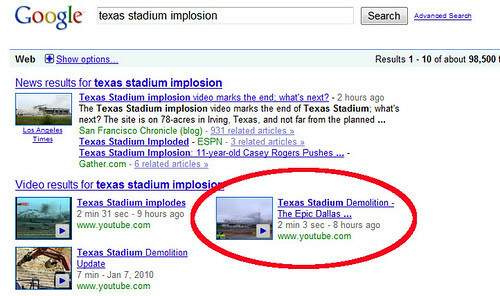 One subtlety of the description was my inclusion of a link over to my personal blog, where I’d written a matching blog post about the experience, “Texas Stadium Implosion – Huge Demolition Event“. This allowed people who came across the video to read up my longer description of the whole deal. In YouTube, I did a few other things as well. I specified which of the three video stills would be used as the thumbnail preview for the vid when it appears in search results (oh, how I wish they’d allow more choices or would allow one to upload a custom image for that). I also set loosest requirements for user interactions with the video page, allowing people to rapidly interact with the page with instant gratification. Allowing instant gratification in this manner can encourage more and faster user-interactions with the page such as comments, video responses, voting on comments, ratings, embedding and syndication. While setting loose requirements often makes major corporations very nervous, my settings show how enabling rapid interactions can push the success of a video, since many of these YouTube components are signals for user-interest and therefore rankings. Having these interactions appear rapidly is more vital under Google’s RealTime Search algorithms. Finally, I also set the Date to display “Today”, and associated the video with the map location of the Texas Stadium in Irving, allowing the vid to essentially be geocoded to appear in local search results in Google Maps. Outside of YouTube, I twittered about the Texas Stadium implosion frequently, and also posted my still photos of it on Flickr at “Texas Stadium Implosion“. In my blog post about the demolition, I embedded the video. I also linked to the video from the Flickr images and from my Twitter updates. 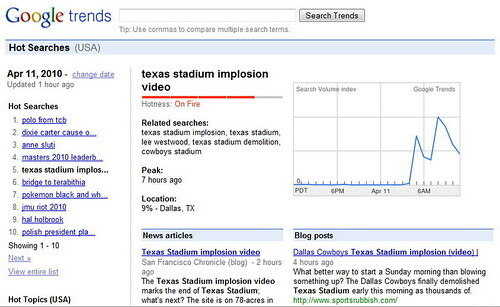 I later blogged again from another blog, posting “Texas Stadium Demolition Case Study – YouTube Still Tops For Video Promotion” on Natural Search Blog. What were the results? Well, the video has had over 55,000 views yesterday, and over a hundred comments! All this to show that achieving top rankings in YouTube and Google search results for video search is not rocket science! There are a few other subtle things that I did in performing the video optimizations, but I’ve outlined many of the most-impactful ones in this article. To get Google Real-Time Search to sing in harmony with keyword search and YouTube search, it’s vital to post content as rapidly as possible as the related search terms first begin trending. It’s also vital to perform solid video SEO, and to encourage rapid/frequent user-generated content on the video’s main page in YouTube. I know that many of you reading this who are building video optimization tactics for promoting major corporation websites are probably concerned about whether you are too vulnerable to malicious comments on your video pages – and this is a valid concern! If you read the comments on my video page, you’ll see that people have used foul language, insulted one another, gotten into arguments, posted conspiracy theories, etc. Cool thing is, YouTube provides robust tools for controlling your video pages. You can delete these comments and also go back to change the setting to require that all comments and “video responses” get moderated and approved by you prior to publishing. So, for corporate work, I’d suggest initially allowing the loose interaction rules until your video really goes hot, then circle back around to delete comments you don’t want to appear and tighten the posting to enable your moderation. In this way, you can achieve popular content, then after your video is established, sanitize any content you dislike and lock it down to keep further from appearing. So, your risk of negativity is very temporary. Using an interlocking strategy of social media, realtime search tactics, and solid video SEO will allow you to maximize the success of your video content, giving you a significant weapon to use in your online marketing arsenal. There’s an old saying that goes, “A picture’s worth a thousand words.” The right image on a web page can communicate ideas that words may only begin to capture. An image in a news article may transport a viewer into the middle of the story. A couple of sharp images, from different angles, may inspire someone to buy something online that they might have only purchased offline previously, like shoes or clothes. A portrait of a writer or a business owner or a researcher may bring an increased level of credibility and trust to a web site. All of the major search engines allow us to search for images in image search web databases. The search engines have also started blending images into their regular Web search results, to add color and diversity to search results, as well as providing a possible way of illustrating different concepts that might be related to a query term with those pictures. While search engines index pages and pictures and videos and a host of other objects that they find on the web, their approach to helping us find images has relied upon text, and upon matching keywords that we enter into a search box. A search engine normally indexes images based upon words that appear on the same pages as pictures, in alternative text associated with the images, or in captions for the pictures, or in text that appears in the address, or URL, for the page, or in the words within links to the photo or page where that picture appears. That reliance upon the words associated with images to index and rank pictures may be changing. Google recently released a paper about PageRank for Product Image Search that looks at similarities within the images themselves to rank pictures in a search. Microsoft just published a patent application on ranking images that looked at nontextual signals about images, such as the number of links pointing to the pictures, how frequently a picture appeared upon a site, sizes and the quality of the pictures, to help rank those images. 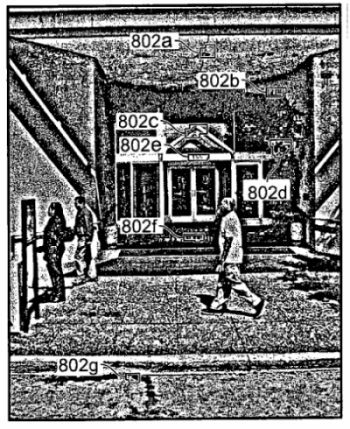 A Google patent application from January described ways that a search engine might read text in images, including the words and signs it sees while collecting pictures for its Street Views project for Google Maps. The picture to the right shows the locations of text in a Street Views image that Google could use in its index. Search engines are getting smarter about how they view, index, and rank images and site owners should probably consider getting smarter about the images that they use on their pages to illustrate what they have to offer. Ultimately, the technology “will allow you to point your camera phone at a movie poster or a restaurant and get an immediate review of the film or the fare on your cellphone, which will tap into databases,” said Mr. Neven, who foresees one billion camera phones in use worldwide by 2010. Imagine snapping a photo, and having a search engine provide you with information about the subject of that picture. Google acquired Mr. Neven’s startup a couple of years ago, and in the Official Google blog, they told us that one use of the technologies transferred in the acquisition would be A better way to organize photos? Having software that could look at your photo collection, and index and organize your images based upon what it sees in the pictures themselves is pretty amazing. But the image recognition technology from Nevenengineering could do more than sort photos. It could also be used to search for information related to images. And before the company developed a consumer related product, it started out as a biometrics company, providing technology for law enforcement and the military. A presentation on one of their technologies, SIMBA: Single Image Multi-Biometric Analysis (pdf), provides an idea of some of what the company has been capable of when it comes to recognizing faces and associating them with people. And the technology is capable of performing facial recognition in videos as well as still images. Faces First, Other Image Features Later? Google doesn’t offer the ability to search based upon images that you upload to the search engine. At least, they don’t yet. But, it appears that they may have a start on technology that could make the possibility into a reality at some point. Last year, a post on the Google Operating System blog pointed out a way to Restrict Google Image Results to Faces, News by adding a string of text at the end of the addresses, or URLs, for each of those types of searches. A patent application published by Google recently described how the search engine can take facial images that it has associated with specific peoples’ names that contain metadata about the identify of those people, and use those pictures to build a statistical model of their faces. A method includes identifying a named entity, retrieving images associated with the named entity, and using a face detection algorithm to perform face detection on the retrieved images to detect faces in the retrieved images. At least one representative face image from the retrieved images is identified, and the representative face image is used to identify one or more additional images representing the at least one named entity. It makes sense for Google to try to focus upon faces first, before tackling other aspects of indexing images based upon the content of those pictures. If Google can master the indexing of images that it finds upon the Web that don’t have text or metadata associated with them, that may bring the search engine a step closer to being able to provide search results for images uploaded to Google by a searcher. Breaking the problem of indexing and searching images to one aspect of images, such as facial recognition, could allow the search engine to address image searching in incremental steps. Choosing facial images as a first step in developing a smarter image search technology does have some issues associated with it, especially from a privacy stance. Allowing people to upload images of faces, to search upon those may raise a number of privacy issues that a search engine may not want to address. Using automatically generated location data, and software that can cluster together similar images to learn about images again goes beyond just looking at the words associated with pictures to learn what they are about. The narrow focus of this project again allows for the development of a smarter image search technology in an incremental approach – associated with well known locations. It’s possible that this choice of topics won’t raise the number of privacy concerns that Google’s focus upon faces may. Approaches from search engines to indexing and ranking images may soon be incorporating technologies that move them away from a strict reliance upon text that appears on the same pages as the pictures, if they aren’t already. Images are being shown in Web search results in increasing numbers, so changes like this happening in an emerging area of search should be something to keep a careful eye upon. Images on a web site can help illustrate the ideas and concepts on web pages in a way that words alone can’t. If the pictures can capture the essence of a concept or query through the use of text associated with the pictures on those pages, and even in the absence of such text, they may start appearing in blended search results at one of the major search engines. 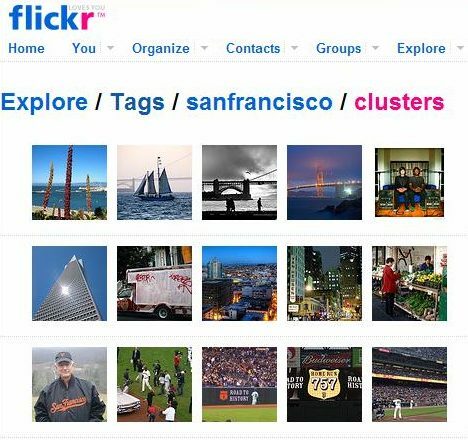 Using facial recognition technology, or clustering images around landmarks based upon geographical tags and similarities in pictures are just two steps towards the development of image search technology on the web that relies less upon words, and more upon what is captured in those images. The right picture on a web page may become not only a way to illustrate the ideas being presented on that page, but also a way for people to find that page based upon the content of the image rather than just the words that surround it. Last week I had the delightful opportunity to present on the Travel & Search panel at Search Marketing World 2008 in Dublin, Ireland. It was a really great event that featured not only search marketing in Ireland, which is growing by leaps and bounds, but search marketing across the UK and Europe. Not only did Chris Sherman of Search Engine Land give a great keynote speech, but Mike Grehan of Acronym Media presented a panel on linking, Bill Hunt of Global Strategies and, Jon Myers of Mediavest spoke on Integrating Search Into Your Media Plan, and Dave Davis of Irelandâ€™s own RedFly Marketing presented on Blogging & Search. The Travel & Search panel brought up some interesting topics. From why the travel industry should care about search marketing, to why it should care about mobile and finally my topic of social media and travel, the panel covered a lot of information that businesses in the hospitality industry should be looking at to be competitive in this online market. Both of my industry colleagues, Nick Walsh and Teddie Cowell brought some great information to the audience. Businesses who find themselves right in the center of the hospitality industry like hotels, resorts, restaurants and tour companies, find themselves in an ever evolving market space when it comes to online marketing. 3rd party booking engines are a godsend and a problem, social media is this big area that is rapidly growing and a place that can make or break a business, and mobile search is coming on so fast, no one really knows what to prepare for. Understanding all of this and being able to handle it is a big task for a lot of businesses in the hospitality industry. The big question that really came out of the panel is â€œWhy should the Travel Industry care?â€ â€¦ about online marketing, which encompasses SEO, PPC, Mobile, and Social Media. There are a lot of reasons to care, and they all boil down to the companyâ€™s bottom line of making a profit. Although some of it is hard to directly relate to it, every segment of online marketing can have a direct affect on the bottom line. Looking at hotels, making sure your site is optimized for the search engines can help ensure their site is the rankings for their listings. Not only that, but making sure that their own sites have a capable booking engine and prices are in line with both the competition and the 3rd party booking sites like Expedia, Hotels.com and Priceline, can help these hotels keep the relationship personal with the customers booking on their sites. In the end, it saves the hotels commissions, which helps their bottom line, and creates a valuable relationship with the customer that usually brings them back to their hotel again and again. Social media has increasingly had a growing affect on businesses in the hospitality industry. From forums to review sites and then tack on blogs, businesses have a lot on their hands when it comes to not only promoting their services, but also when monitoring their brands and services. One bad post about a guest not having their sheets changed for 17 days is enough to drive enough potential customers away that it makes a difference in the bottom line. Knowing how to handle and embrace the good as well as the bad, is essential to this industry. Finally mobile is about to take this industry by storm. Ensuring websites are mobile friendly is not just a â€œniceâ€ thing to have; soon enough it will be essential if you want to keep up with the competition. From maps to find the business, to making reservations with smart phones, mobile will soon be a force that can no longer be ignored. So where does this leave the travel industry? To be honest, it leaves them in a place with a lot of great marketing possibilities. Itâ€™s a great time for the hospitality industry to embrace a lot of new ways to market their businesses and improve their bottom lines, to reach out and engage customers and create rewarding relationships. Are you a hotel, a restaurant or even a tour company, are you thinking about embracing any of these great ways to market your business? Perhaps now, is the perfect time to take a second look at online marketing! Stop over at Search Marketing Gurus for additional coverage of Search Marketing World. This past week I presented at SMX West in Santa Clara, California on the Retail and Blended Search panel. It was quite interesting to be on a panel that also included representatives from both MSN and Yahoo Shopping divisions. There was a lot of information given, from making sure your images had feeds to looking beyond feeds for promotion of online retail products. As we progress further and further with technology and the availability of broad band to shoppers, searchers are looking for more than just a blue link on a search results. Searchers are becoming more savvy as technology progresses, and as more and more options are being provided to them, they actually WANT more than just a blue link. So where does that leave the retailers on the web who have invested so much in feeds? Retailers need to start thinking outside of the box, because if they merely rely on a feed to get the traffic to your page, eventually as the search results become more engaging. Retailers who just rely on the feed links will loose out on all those people clicking on video links, picture links, social media profiles, and reviews. So what’s a retailer to do? Make sure your products have images. Make your put captions underneath image. Make sure your images folder is accessible to the search engines. Make sure your images are of good quality. Google actually shows different images in blended search than it does in regular image search. The thing to remember with images is that shoppers are very visual and if you have the opportunity to take advantage of image search why not put your best foot forward? Here’s a perfect opportunity to engage consumers via a social media medium. 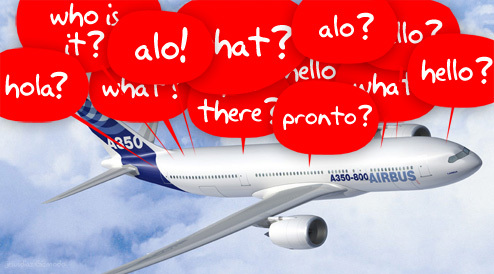 It’s visual, its interesting and it engages a customer into finding out more information. Utilize a few of the social video sites, by uploading some short videos of product demonstrations, humor takes, or even “how to” videos. If you make them fun and interesting, there’s even a chance for them to become viral and while not directly on your site, if the description is optimized with a link to your site or the page the product is on, this can be another traffic driver, beyond the search engine. If you can start reviews of your products on your site, this could be a powerful resource to help raise the quality of the page. Amazon uses this very wisely and to their advantage. Rating & review sits such as Epinions and Yelp, also hold a lot of value and can help with with yet another way to “indirectly” hold another position in the results. Having profiles on various – relevant – social media sites are another way to help bring awareness to your brand, as well as your products or services. 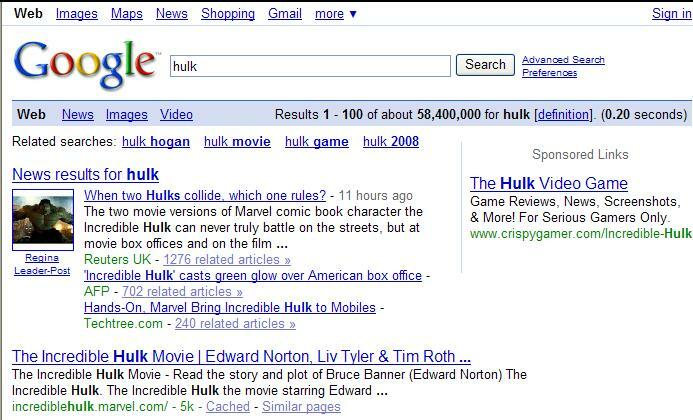 People link to social media profiles, so just like with rating and review sites, it is possible to own another spot on the SERPs in an indirect manner. Make sure that your profile on all of the social media site you belong to is properly filled out with the right URL, emails, contact information, etc. These are just a few ways retailers can broaden their reach, beyond the regular product feed. Starting to think beyond the feed and planning a full online marketing strategy will open a lot more opportunities for retailers in the new realm of blended / universal search.